There are about 10 million Americans that need assisted living. This statistic ranges from the elderly to the disabled (all ages) alike. The major reason why people go into institutions of assisted living is because they can no longer shower or bathe independently in their own home. 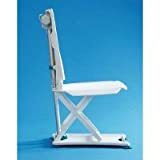 The Bathmaster Sonaris bath lift can provide an avenue for people the freedom to stay in their homes and live with comfort as he or she enjoys the benefits of a therapeutic bath. This bath lift for the disabled is made of all-plastic construction and is easy to clean, yet strong and durable to ensure stability and years of use. There are several key features of Bathmaster Sonaris bath lift that make it one of the industry's top seller. Any angle can be selected and recline up to 40 degrees to achieve the most comfortable and suitable position for the user. The Sonaris is the only bath lift in the industry that has a single-button operation that allows the user to control the unit at will. One can position the backrest upright or recline it back to a more relaxed position. Sufficient leg room is maintained during these processes for a comfortable position in the bath tub. The hand controller has large, textured control pads to assist the visually impaired. The safety mechanism is built-in and will not allow the bath lift to lower into the tub if there is not a enough charge to lift the user back up. Furthermore, the waterproof hand remote will show a warning light and sound off an audible beep letting the user know the bath lift is in need of a charge. The Bathmaster's Sonaris possess a self diagnostics system to determine if there are any issues with the bath lift. To optimize battery performance, there is an automatic sleep function that comes into effect when the product is idle for 10 minutes. The sleep function is easily disabled by pressing the control pad. This tremendous product has a loading capacity of up to 300 lbs and it lowers the user to 2.5 inches.